Adequate sleep is a must for good health. It is a required activity, not an option. Sleep enables the body to rest, restore the energy levels, and carry out other processes (physiological and psychological) associated with maintaining optimal health. Unfortunately, a large number of us do not get the 8 hours of rest that we need in the form of sleep. Insomnia is defined as the inability to fall asleep or the incapability of staying asleep on most nights, sometimes every night. Other symptoms include waking up too early in the morning, experiencing tiredness, having trouble concentrating, and being irritable through the day. 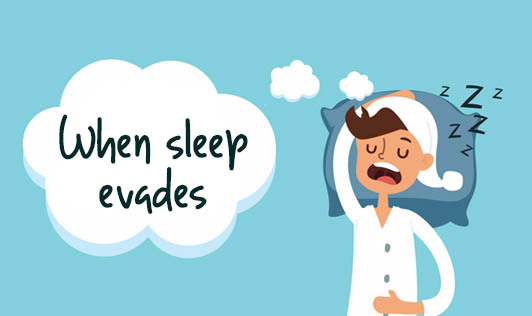 This condition causes an individual to be faced with sudden attacks of sleep through the day. Narcolepsy causes an individual to doze off at inappropriate times, without any prior warning signals. This condition is often confused with depression, epilepsy, or side-effects caused due to medication. Narcolepsy probably results from a combination of genetic and environmental factors, some of which have been identified, but many of which remain unknown. The first symptoms usually occur during adolescence or young adulthood. Snoring may seem annoying or funny to some, depending on which end of the humor spectrum they fall in; but it is a serious, potentially life-threatening condition for the person experiencing it. It is also one that is often misunderstood. Sleep apnea is characterized by minor interruption in the airflow during sleep. It occurs when the airflow gets blocked, often due to excess tissue, such as enlarged tonsils, or a large uvula (the small fleshy pendulum of tissue that hangs from the back of the soft palate on the roof of the mouth). When the passage is blocked, breathing takes more effort and this causes a suction-like force in the upper portion of the airway. This can lead to heavy snoring or pause in the airflow caused due to low levels of oxygen or high levels of carbon dioxide respectively. Each time the body encounters obstruction, a signal is sent from the brain to the upper airway muscles to signal them to open up. At this point, normal breathing resumes, usually accompanied by a loud snort or gasp. Obstructive breathing causes the individual to keep shifting from deep to light sleep. RLS causes an individual to experience unpleasant sensations in the legs or arms, such as creeping, crawling, tingling, pulling, or pain. These symptoms can occur suddenly while lying down or sitting for prolonged periods of time, such as at a desk, in the car, or while watching a movie, or trying to sleep. Unlike narcolepsy or sleep apnea, RLS symptoms follow a set cycle, causing more trouble during the evenings and nights. The sensations may usually be felt in the calf area, but are not restricted. They can be felt anywhere between the thigh and ankle. RLS affects one or both legs with sensations also felt in the arms. It can be especially distressing because it produces an irresistible urge to move the legs and arms when sensations occur, and this makes sleeping very difficult for such individuals. Although many of our sleep problems can be bettered with simple changes in the daily routine or in the sleep environment, sometimes this may not be enough. If you are having a particular problem with sleep and if it has been going on for a long time, you should consult a sleep specialist.